Former President Jimmy Carter urged President Obama and Secretary of State John Kerry to reject construction of the Keystone XL oil pipeline on Wednesday, warning that the project would worsen the damaging effects of climate change and saying their decision would define their legacy "on one of the greatest challenges humanity has ever faced." "As you deliberate the Keystone XL tar sands pipeline, you are poised to make a decision that will signal either a dangerous commitment to the status quo, or bold leadership that will inspire millions counting on you to do the right thing for our shared climate," explained a letter signed by Carter and nine other former recipients of the Nobel Peace Prize. The letter appeared as a newspaper advertisement on Wednesday morning. The proposed project would transport crude oil harvested from tar sands in Canada to refineries on the U.S. Gulf Coast. Supporters have said it would be a boon for job creation and domestic energy production, but opponents have warned that oil extraction from the tar sands -- among the most carbon-intensive methods of energy production -- would greatly expand if the project is approved. "You are among the first generation of leaders that knows better -- leaders that have the knowledge, tools, and opportunity to pivot our societies away from fossil fuels and towards smarter, safer and cleaner energy," the letter said. "History will reflect on this moment and it will be clear to our children and grandchildren if you made the right choice....A rejection would signal a new course for the world's largest economy. You know as well as we do the powerful precedent that this would set. This leadership by example would usher in a new era where climate change and pollution is given the urgent attention and focus it deserves in a world where the climate crisis is already a daily struggle for so many." The project has been pending before the Obama administration for years, and because it crosses an international border, the State Department holds primary responsibility for approving construction. In November 2011, the administration delayed an approval deadline on the pipeline, pushing the final decision back at least a year. Since then, the State Department has said it needed to finalize environmental impact analysis on the project before making a decision. And in January, the final report from the State Department concluded that the pipeline would not significantly increase carbon pollution. The pipeline " is unlikely to significantly impact the rate of extraction in the oil sands or the continued demand for heavy crude oil at refineries in the United States," the report said. 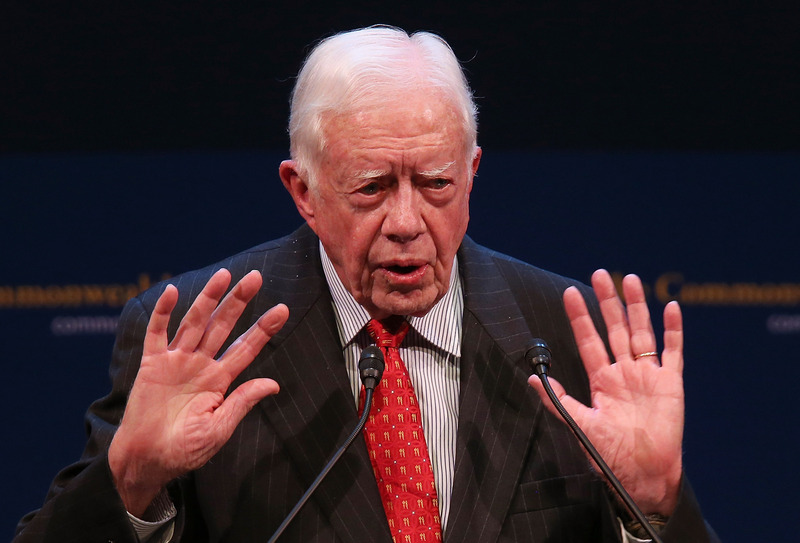 In affixing his name to the letter, Carter becomes the first former president to weigh in against the proposed project. Former President George W. Bush has called building the pipeline a "no-brainer," and former President Bill Clinton has said "we should embrace it and develop a stakeholder-driven system of high standards for doing the work."